Oh and to answer a few questions: Why Before Infinity? What's that picture on your blog title? What's that picture at the bottom of your page? Why that poem? Why is your url "Xavier's Revenge?" My, my, one at a time. The last line of one of my favorite poems, The Final Act by José de Diego is "before infinity." The poem ends with possibly de Diego's death under a colonized Puerto Rico, where his coffin is draped by the island's flag. Once the island becomes free, he escapes from the coffin and uses the flag as a shroud, "hoisted high...before infinity," which can be interpreted as the glorious experience of freedom that can never be robbed from one's collective memory, even in death. Or that not even death can cease the thirst for freedom. The main picture is a photograph by Jamel Shabazz, a black New York City photographer, famous for capturing the nascent Hip-Hop scene in the 1980's - a dangerous and creative environment that I was born into. The bottom picture is a piece of a mural by my favorite artist Rafael Tufiño called "La plena." This piece is depicting the famous song called "Le Cortaron a Elena" - "They cut Elena," which can be interpreted as the struggles of life, poverty, and the wonderful rhythms that death may bring, which is also echoed in the sarcastic and political poem by Miguel Piñero. 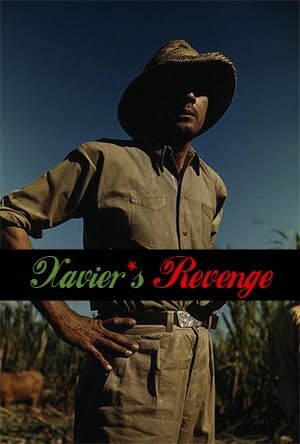 As for "Xavier's Revenge," that lies at the hands of the resurrection of one of the greatest pleneros Rafael Cortijo by the eloquent and breathe-taking essay by Juan Flores called "Cortijo's Revenge." Rafael Cortijo, being a black Puerto Rican was venerated in life as a great musician but in death he was the center of controversy over the suggestion that his name should grace the title of the Capital's bourgeoisie performance hall of "culture" - Centro de Bellas Artes, which ironically stands where his house once stood. Long story short, after much racist and classist mud-slinging, the hall would be named after Luis A. Ferré (who was rich, half-Cuban, right-wing, white, and a former pro-statehood Governor). 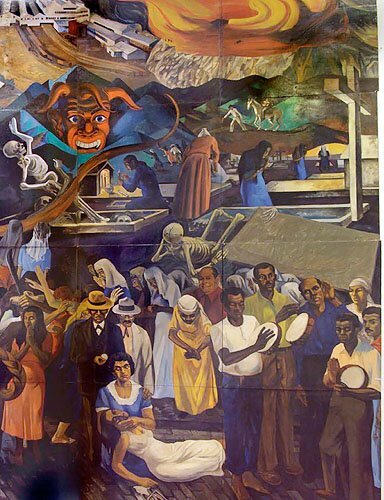 Nonetheless, it was Cortijo's revenge that a poor, black plenero (which is a Puerto Rican form of cultural production unlike ballet and symphony orchestras that resonates through the performance hall) from the ghettos of Santurce would spark national debate on race, class, culture, and identity. I am a poor, black Puerto Rican from the ghettos of New York and Chicago, but if you comment on my blog, then you have read what I had to write. Who would of thought that a marginalized human being as myself could capture your attention? Xavier's Revenge!